Jane Austen fans will delight in the reissue of this classic Regency Romance by Judith Harkness. With a light touch and witty eye for human foibles, Harkness paints the fashionable world of Regency England, when styles were dictated by Beau Brummel, the Duchess of Devonshire held court, and dandies paraded in their phaetons and four. Groomed by their mamas to capture the hearts of the most eligible bachelors of the day, fashionable young ladies passed the Season at Bath, where they were presented at the Assembly Rooms in all their finery and feathers. Lady Rosalind Arden, daughter of the late Lord Iseleigh, has come to Bath for the Season, too, and it is her intention to capture a great fortune -- though not for her own sake. Obstacles continue to spring up in her way, however, most critically in the form of her own heart’s refusal to cooperate in her pursuit of fortune, at the expense of love. There is, for instance, the maddening and mysterious Peter Grey, who dares to challenge one of the greatest rakes in all England, immensely rich, dashing Reginald Darnley, intimate of the Prince. And what of Maude Quimby, the heartbreaking invalid, quietly suffering in her shabby rooms far from the fashionable center of Bath? Will the young earl succeed in his ambition to save his sister from a disastrous alliance, or will Roselind, innocent as she seems, astonish the world with her stubbornness and courage? The key to all their happiness lies in what has become known as the Montague Scandal, and with the revelation of the truth of that sordid affair, the secret to all their futures rests. 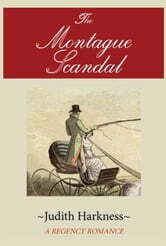 Brimming with period detail, The Montague Scandal will delight readers craving a good, old-fashioned romantic caper in the tradition of Jane Austen and Georgette Heyer. Judith Harkness is the author of five classic Regency Romances: The Montague Scandal, The Admiral’s Daughter, The Determined Bachelor, Contrary Cousins, and Lady Charlotte’s Ruse, all originally published by Signet. She is the co-author of a screenplay, EMMA in New York, an updated version of the classic Jane Austen novel set in contemporary Manhattan. As J.H. Richardson, she writes non-fiction on subjects ranging from children with learning and developmental issues to profiles of notable creative artists. She lives in Rhode Island with her husband, Will Taft.